The chapter integrates key clinical recommendations from the present handbook’s chapters in a brief, outline format. The editors present a synthesized approach to addressing the use of Parent-Child Interaction Therapy (PCIT) with children on the autism spectrum. Takeaway points are highlighted by providing short descriptions and examples. Additionally, a novel third phase, entitled Social-Directed Interaction (after standard PCIT treatment is completed), is introduced by the authors as a method of employing parents to assist in the critical areas of child communication and social functioning. 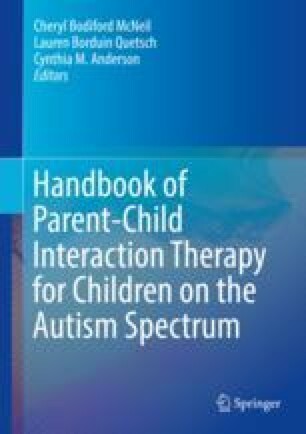 The chapter highlights ways that PCIT can be used to address disruptive behavior, the parent-child relationship, and core features of autism spectrum disorder.